Ah, fall—there's nothing like crisp, cool air, the first months of school and luscious foliage to get you excited for the changing seasons. Your pet, too, is probably welcoming the break from hot, sticky weather. But pet parents, beware—fall is also a time of lurking dangers for our furry friends. From household poisons to cold weather hazards, the season is a minefield! Here are some tips to keep your pet snug and healthy during the autumn months. It's back-to-school time, and those of you with young children know that means stocking up on fun items like glue sticks, pencils and magic markers. These items are considered “low toxicity” to pets, which means they're unlikely to cause serious problems unless large amounts are ingested. However, since gastrointestinal upset and blockages certainly are possible, be sure your children keep their school supplies out of paw's reach. Training tip: If you and your pooch haven't been active outdoors in a while because of the summer heat, do some remedial recall training. Dogs, like people, get rusty on their skills if they aren't using them. Many people choose fall as the time to change their car's engine coolant. Ethylene glycol-based coolants are highly toxic, so spills should be cleaned up immediately. Consider switching to propylene glycol-based coolants—though they aren't completely nontoxic, they are much less toxic than other engine coolants. Do you like to go to football games or tailgate parties in the fall? If you’re planning on bringing your pet, it’s important to make sure that they’re safe. Picnic foods –such as greasy burgers, sugary desserts, ribs, chicken with bones, and shish-kabob sticks—can be extremely dangerous for your pet if they’re consumed! Also charcoal grills can be easily knocked over by excited or skittish pets, causing injuries. Remember to keep your pet safe and secure while you’re engaging in activities that could be dangerous for them. 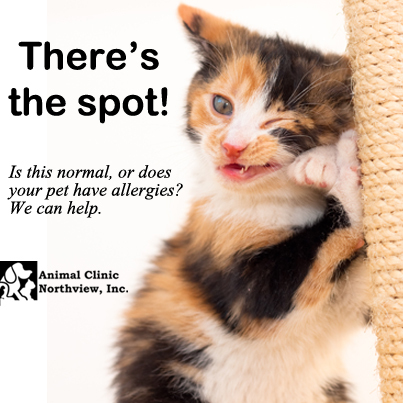 Itchy, rashy, and uncomfortable skin, and painful or gooey ears, are symptoms that your pet may experience if they suffer from allergies! Fall is often a season where allergies are worse than ever, so it’s important to contact us right away if you notice these signs. We can help relieve your pet of their uncomfortable symptoms.